Dozens of firefighters are tackling a major blaze in Salford. Crews were scrambled to Langley Road in Lower Kersal, Salford, after a number of 999 calls reporting the fire. A fire service spokesman said it’s believed the blaze involves around 50 cars on land behind Salford Car Breakers Ltd. Currently, around 30 firefighters are at the scene. Residents are being advised to keep windows and doors closed as a precaution. A dramatic image taken of the blaze by a witness from across Littleton Road playing fields captures the extent of the emergency. Fire crews are using an aerial platform to fight the flames from above and there haven’t been reports of any injuries as yet. It’s understood that some of the vehicles on fire are scrap cars. Firefighters in Salford are fighting a big fire in a scrap yard on Langley Road – residents in Lower Kersal keep doors and windows closed. Greater Manchester Fire and Rescue Service are expected to remain at the site for a number of hours and an investigation is expected to be launched to establish a cause. A spokesman said police have closed the road, which runs opposite the River Irwell. 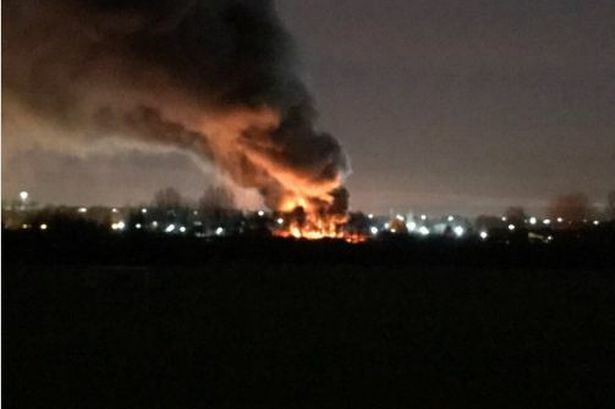 In a statement, the fire service said: “Residents in Lower Kersal and Broughton are being advised to keep their doors and windows closed while firefighters tackle a large fire involving up to 50 cars in a scrapyard.